The turning point in Isabella’s life came on June 1, 1843, when at the age of 52 she adopted a new name, Sojourner Truth, and headed east for the purpose of “exhorting the people to embrace Jesus, and refrain from sin.” For several years, she preached at camp meetings and lived in a utopian community, the Northampton Association for Education and Industry, which devoted itself to transcending class, race, and gender distinctions. Even though the community lasted less than five years, many reform-minded influential people visited Northampton, including abolitionist leaders Frederick Douglass and William Lloyd Garrison. Through these connections, she began to speak at public events on behalf of abolition and women’s rights. In 1851, she gave her famous “Ain’t I A Woman” speech at a Women’s Rights Convention. In 1857, Truth bought a house with the help of friends in Harmonia, a small Spiritualist community near Battle Creek, Michigan. 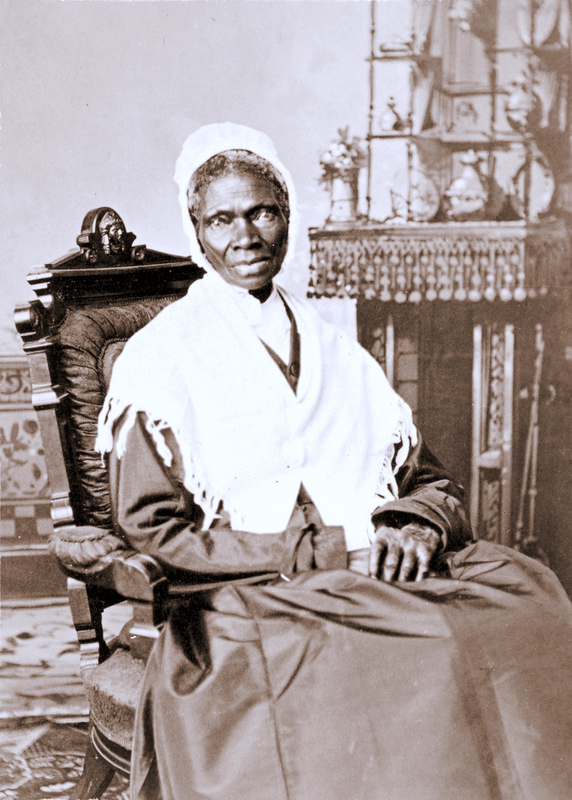 She supported herself through speaking engagements and selling photographs of herself as well as her book, Narrative of Sojourner Truth, written by an amanuensis, since she was illiterate. When the Civil War began, Truth threw her energy into soliciting food and clothing for the volunteer regiments of black Union soldiers. Then the plight of freed slaves caught her attention, many of whom were living in refugee camps in the nation’s capital. She championed the idea of a colony for freed slaves in the American West where they would have a chance to become self-supporting and self-reliant. She garnered numerous signatures for her petition urging the federal government to provide land for this endeavor. Although she presented the petition to President Ulysses S. Grant, her dream never materialized. Nevertheless, when a large migration of freed southern slaves made their way west in the fall of 1879, despite her advanced age, Truth traveled to Kansas to help them get settled. Sojourner Truth died in Battle Creek, Michigan on November 26, 1883. She was 92. Olive Gilbert and Frances Titus, Narrative of Sojourner Truth; A Bondswoman of Olden Time, Emancipated by the New York Legislature in the Early Part of the Present Century; with a History of her Labors and Correspondence Drawn from her “Book of Life” (1875); Carleton Mabee, Sojourner Truth: Slave, Prophet, Legend (1993); Nell Irvin Painter, Sojourner Truth: A Life, A Symbol (1996), Priscilla Pope-Levison, Turn the Pulpit Loose: Two Centuries of American Women Evangelists (2004).